What is the Gumby Dog Toy? The Gumby Dog Toy is sure to be your dog's new best friend. 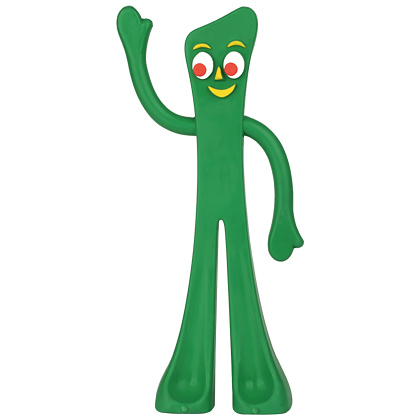 Gumby measures 9 inches tall and his bright green rubber material will provide your pet with hours of chewing, pulling, and fetching fun, whether inside your home or outside. How does the Gumby Dog Toy work? All dogs will instinctually love to chew on their new Gumby toy. Do not permit your dog to continue playing with a toy that is broken or damaged. Please discard if toy tears. Gumby is the perfect dog toy for your favorite four legged friend! Gumby's flexible rubber material will help your pet stay entertained for hours whether chewing, tugging, or being used to play fetch. Store in a cool, dry place away from heat and flame.